I enjoyed a very Good Friday. I worked on projects in the a.m. and at 12:15 walked in the rain from the Zona Roja to Cuenca’s El Centro. Since I’m from Los Angeles where it rarely rains, I was reminded of the times I’ve walked in the rain in Paris. At 1:00 pm I met up with a British teacher of English at a French café on Parque Calderon. The teacher is always fun to talk to; he’s been in Ecuador 17 years and provides me with remarkable insights about what I seem to be experiencing. When it was time for my British friend to leave and meet up with other friends, an elderly man walked in, accompanied by his family. The family seated him on a bench about 2’ from me. Oh my. I had the biggest smile on my face watching him and listening – his conversation was sharp and clear, his appetite impressive, his cheerful demeanor inviting. It was meant to be, we met up. 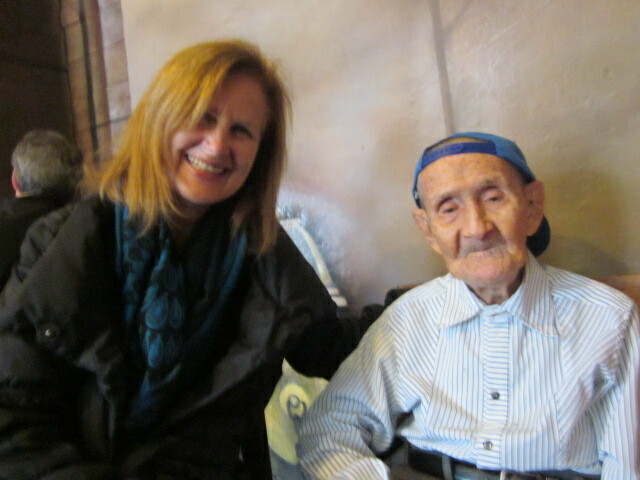 The man’s name is Cesar and he is 102 years old. According to his niece, he does not suffer from any ailments, he is in excellent health. You could tell by his remarkable energy. 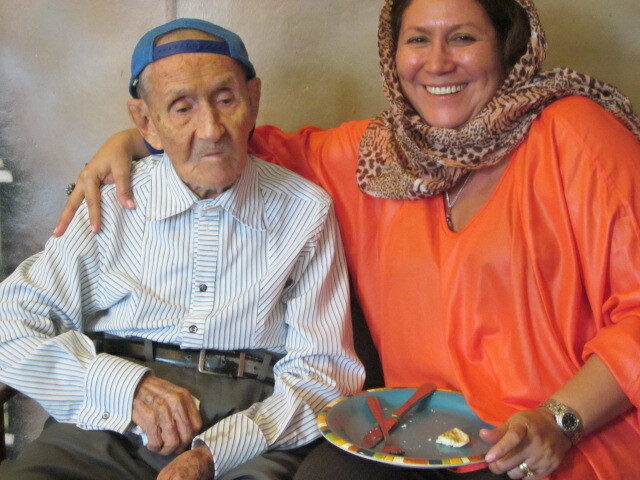 Cesar was driven to Cuenca from Guayaquil earlier in the day by his grand-nephew – a 3 hour trip on winding roads – to visit family!!! I asked how Cesar spent his years, he said he had studied English, was an English teacher but did not work often as there was not a lot of interest in learning English when he was a young man. I asked his niece how he managed to pay for his life if work was sporadic, she said he inherited money to last a life time so he never has felt much stress. I was wondering, is this one of the secrets to longevity? Cesar wanted to practice his English with me: Are you married? How much money do you have? Cesar is cute……very cute… and was a wonderful gift on this day (as was the chance to see my British friend again). Happy Easter Cesar!! And thank you; you and your generation are an inspiration! Entry filed under: Seniors in Ecuador, Travel blog. Tags: Elderly in Ecuador, meeting Ecuadorians, seniors in Ecuador.